Sarah Lewis, Director of Field Marketing at Ivanti, was recently named as one of the Top 25 Women in Tech by PCR Magazine. This is part of PCR Magazine’s Women in Tech special issue, which sought to spotlight women of all levels in their career who are shaking up the industry. When asked what this honor means to her, Sarah said, "It means everything! I am so passionate about diversity in technology, so to be able to put my all into this project and then to get recognition like this is just the cherry on the cake. I also hope that it shows other women working in the technology industry that you do not have to be in a ‘technical’ role to get involved and add value." Sara Coppock, contributor to the Women in Tech team, had glowing things to say about Sarah: "We’re so proud of Sarah for building this campaign up from scratch; it’s so inspiring to see what she’s accomplished." Another team member, Roisin Tims, echoed this sentiment: "Sarah deserves this. What Sarah has created is special." In addition to receiving this honor, Sarah is proud of the many other accomlishments of her Women in Tech team. This includes a Women in Tech survey—with fascinating feedback from women across the world—work with Ivanti’s UK Talent Acquisition Team to remove unconscious bias in job postings, and getting interviewed on the ITAM Review Podcast. "I am not a natural public speaker and it took me way out of my comfort zone," Sarah said about the podcast, "but I enjoyed it and am very pleased with the results. Just goes to show you should ignore that ‘imposter syndrome’ voice whispering in your ear when faced with a challenge." In their spotlight of Sarah, PCR Magazine highlighted Sarah’s work as the Director of Field Marketing at Ivanti, where she manages Ivanti’s marketing and SDR teams in over 80 countries including the UK, Ireland, the Middle East, Africa, and Eastern Europe. 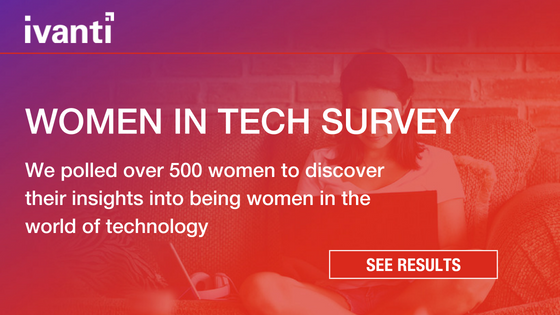 They also highlighted her work launching Ivanti’s Women in Technology campaign, which started with @TheTechieGirls Twitter platform and has extended into an active blog, a survey, a Women in Tech Report, and more. "I have learned so much since initiating this project," Sarah said. "I find myself chatting to people about diversity almost every day and I am constantly learning something new. The stand out thing is just how many women struggle with diversity issues in the workplace. Whether it be unconscious bias from team members, being overlooked for major projects or promotions, or simply not having the confidence to drive their careers forward, there are complex issues at play." The list of Top 25 Women in Tech also includes women from companies like Dell, EY, Intel, Lenovo, and even Ivanti partner Tech Data (shout out to Celine Naude for the honor!). As Sarah looks ahead to 2019, she has quite a few exciting goals to extend the work she has been doing. She hopes to organize more face-to-face networking events, continue to grow @TheTechieGirls online community, and do another social media campaign after the success of her 2018 #MySuperPower social media campaign. “My personal goal for 2019 is to take some time to support and mentor one or two people. I have dabbled in this a bit but never formalized (again, I blame that pesky ‘imposter syndrome’), but it is time for me to step up to the plate and support another woman, or two, to realise her dreams,” Sarah said. Join me in congratulating the incredible Sarah Lewis on this honor! And don’t forget to follow @TheTechieGirls on Twitter to stay connected to Women in Tech news and events.